The amount of content produced is staggering. According to Gary Vaynerchuk, New York Times best-selling author, he cites that there is more content produced in 48 hours than what has been produced from the beginning of time to 2003. The strategy of just ‘being present’ in content and on social media has not worked, and will not work. If you are finding your engagement to be low in social channels with the content you are sharing, it’s time for a different approach. As Marketers, we are all susceptible to becoming enamored with our own point of view, and as a result, we end up doing all the talking. When people don’t listen, we talk louder. In marketing, “talking louder” takes many forms, such as email blasts, Facebook posts, Tweets. This even shows up in our retargeting efforts. These approaches are what I refer to as Bumper-Sticker Marketing. The premise of the ‘bumper-sticker marketer’ is that it is one way communication that shouts a point of view, but fails to engage others in meaningful ways, and certainly fails to persuade. One of the common struggles I hear relative to producing content is lack of ideas for what content to produce next. If you find yourself struggling with what to talk about, you may not be as close to your customers as you think you are. If that’s the case, time for a change in your social media strategy, which will benefit you in your content strategy as well. Assuming you know where your customers are spending their time on Social Media, pay attention to what they are talking about. Listen for the key words and phrases they use to describe their problems, concerns, and struggles. We are listening and learning so that we can speak their language, rather than trying to get them to understand our own language. One strategy I use, that may be helpful to others is to do the following. Use your favorite social monitoring tool(s) to identify the keywords your customers use to search your competitors sites. Additionally, I look at large, non-industry sites like Reddit or Mashable, then filter down to the category in my field/industry to see what people are searching for and talking about. For example, if I filter by Internet and Telecom, I find the top trending words in their keyword cloud are ‘web2.0,’ ‘blog,’ and ‘social networking.’ (See below). This 60-second process gave me three different topics from which I can produce content about that will be relevant to my audience. When content is relevant and valuable, your audience is more likely to engage. What’s more is I now know the specific words to build my SEO strategies around with HREF, H1 tags, etc. Looking for keywords is one thing, but remember, we want to understand our customer’s concerns and speak their language. Therefore, I take the keywords of interest listed above and search conversations in Twitter and Facebook to try to ascertain what their intent is behind their searches. In searching #web2.0 this morning, for example, I quickly learn that areas of interest to multiple groups is measurement, collaboration and applicability to SMB. Are you finding that hitting your target market is increasingly more difficult? Especially in the age where so many aspects of marketing are changing and evolving such as content management strategies, SEO and social media. This puts even more pressure for marketers to be well-branded and ever-present in the places where prospects are looking, then the top choice when they click thru. Now sales is even being encouraged, appropriately so, to engage in more top of funnel (ToFu) activities in the form of micro-marketing due to this very same phenomena with the buyer’s digital journey. As if navigating these new times wasn’t difficult enough, CMOs must be also able to demonstrate tangible, positive returns on their marketing efforts. That alone is enough to send some CMOs over the edge. While these challenges are certainly real and legitimate, there are some more basic areas of marketing that are falling short, perhaps due to the reasons aforementioned. It’s understandable for marketers with tight budgets to cut some corners while navigating new areas like Social Media…but it is certainly not acceptable. The consequences can be quite substantial. Clarity Test. Your marketing piece should be clearly targeted at a specific segment or customer as time pressed marketers can fall into the trap of generalizing who the marketing is aimed at versus narrowing the focus (e.g., IT versus System Administrators). Test: Can any person readily identify the intended audience of your marketing? Resonance Test. Your marketing piece will resonate more with customers when it identifies their pain points and quantifies the risk of not solving the problem or pain points. Test: Will the customer know after reading your marketing piece, the risk or cost of their inaction? Differentiation Test. The marketing piece should tap into the customer’s felt pain points by focusing on benefits or outcomes, not product features, and lead uniquely to your own solution. Test: If your logo were removed from the marketing, would the solution still point distinctly to your organization? Insight Test. Engaging marketing should grab the reader’s attention with an insight about their industry, category or business. Test: Does the marketing piece provide an insight and if so, is the insight one which could only be obtained by your experience working with many other customers like the target of your marketing? Teaching Test. Whether email, direct mail or other, the best marketing exposes or teaches the customer something about their business that they didn’t understand or had underestimated before, thus leading them to your solution. Test: Can you clearly identify the teaching point in your marketing piece? More importantly, can your customer? Advocate Test. Finally, one overlooked area of marketing is that in an era where more buying is done by committee or consensus, the marketing piece should easily enable the advocate to share internally. Test: Does your marketing evoke a desire to share with internal influencers and decision makers without explanation? Failing in any one of these areas will have some level of impact to your marketing effectiveness. Failing across two or more of these areas will guarantee suboptimal returns. Time and budget constraints are real for most marketers. What many fail to realize is that the shortcuts taken to get marketing out more quickly without applying these filters and tests to the piece first, has a compounding effect on marketer’s time and budgets. The ineffectiveness of any campaign requires more to be done to make up for what the last campaign failed to produce. Conversely, putting these six filters to every one of your marketing campaigns will take major steps towards your marketing effectiveness. Greater effectiveness leads to less pressure on time and marketing spend. Marketing Benchmarks: Has marketing missed the mark? What makes a great Marketer? The best marketers are thought-leaders. Not only are they acutely aware of the drivers of their results, but they have a deep understanding of consumer behaviors and point the organization forward to be prepared for trends and shifts in their behavior. They love [useful] metrics, as this guides their efforts to show better returns over time, not the same or worse. Great marketers are aware of these consumer behavior shifts before they are even perceptible to most in the organization. As a result, you see this most quickly reflected in the marketing in ways that connects deeply with consumers and resonates more so than the common marketing in the marketplace. Good marketing takes work, but what does it take to be best-in-class? Furthermore, how do you compare against your industry? 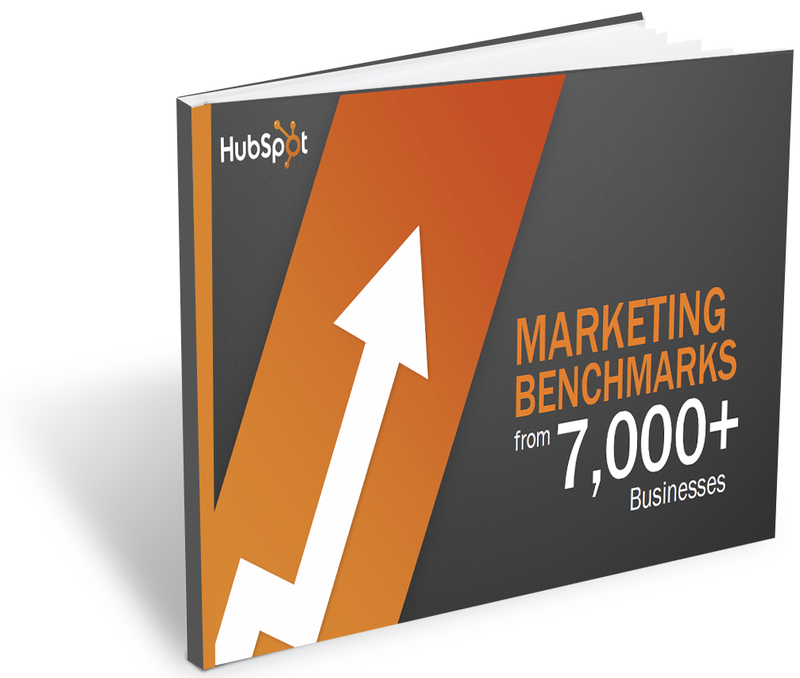 Find out with HubSpot’s latest study, Marketing Benchmarks from 7,000 Businesses. Get a clear idea of how much more you need to do to see the results your organization needs. Download the report to see if your marketing is hitting the mark. 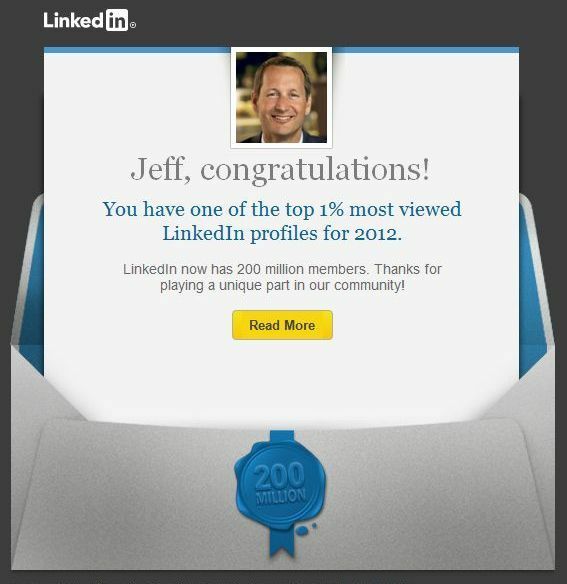 LinkedIn: Are you in the Top 1%? If so, bummer! LinkedIn recently reached out to 10 million of its members with a ‘Congratulations’ for having one of the Top 1% [or Top 5%] most viewed profiles in 2012. This was their way of ‘thanking’ those that contributed to its 200 million member milestone. As for me, I am a bit more cynical on why people are looking at my profile that often. Is it because I am special? Can’t be. I know me. So what, then? Of course, I am over-generalizing in terms of how this is used and I certainly realize the many benefits of being found where people are searching, but it is interesting seeing the different perspectives on the topic. For instance, the other day I read a post of one SEO Consultant on his achievement of the Top 1%. I was surprised to see Mr. SEO quickly cite his top reason to how many first-level connections he had. He went on to share that he receives 15-20 connection requests from strangers per day. His subsequent reasons then pointed to Keywords and frequent Updates to his LinkedIn status. One of his readers commented on his post that they too made the top 1%, but have less than 10% of the connections he has, and spends little to no time at all on their LinkedIn profile. He responded by saying, “I believe if you had more connections you would definitely do even better.” Hmm?! So what gives? How do two people with completely opposite profiles and far different behaviors in their dedication to their LinkedIn profiles end up with the same result of a top viewed profile? Turns out that keywords are pretty important, after all. Even more so than number of connections, Mr. SEO. So, if you are looking to increase solicitations from prospectors, make sure to research trending keywords that relate to you and include them in your profile. Do this, and YOU TOO can join the ranks of 10 million other members to balance the load of solicitations you are sure to receive.